Will Hutchins reminisces about extras. Working as an extra has become a new mini career for people of a certain age on Long Island. Last fall, 23 prime-time series were being filmed in New York. 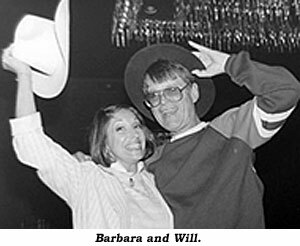 My Barbarita, a budding New York actress in the late ‘60s, joined Screen Actors Guild and found background work in “Hello Dolly” (Walter Matthau was a peach); “Midnight Cowboy” (Dustin Hoffman flirted with her); “Cactus Flower” (Babs once sold shoes to Goldie Hawn at Henri Bendel); “Popi” (with a peppy Alan Arkin); and a slew of TV commercials (she starred in a National plug for Girl Scouts). Way out west, she wore a dazzling gown at the gory high school prom in scary “Carrie”. In recent times, we’ve teamed-up on such puppies as Warner Bros.’ “Gossip Girl” (Col. Warner must be spinnin’ from all the re-takes); “The Taking of Pelham 1-2-3” (Travolta and Denzel winked at us); “The Romantics” (four shivery November days ashore on Long Island’s North Fork). Babs reports, “We were told to wear lightweight clothing. It was freezing off the Peconic. Without any warning, they sprayed us with hoses to create the illusion of a sudden downpour. We were soaked to our skins.” Never mess with the Puerto Rican. That night, while waiting in the sign-out line, Babs cell-phoned Central Casting and gave them what for. “Atta Girl!” We encouraged her, from a safe distance. She absolutely screamed [BLEEP] (Babs, WC is a family publication). Fondly, I recall the brother-and-sister-hood of Warner Bros. extras. There was no “cast system” back then. We all got along, on the set and after hours. We were all part of the Warner “family.” Some were regulars. They were there when I came aboard. They were there when I was put out to pasture. My first show at Warners was “The Magic Brew” with Jim Backus. Extras galore—one was drawing all the attention. Who was he? Why, Creighton Hale of the silent screen. Remember him in Paul Leni’s “The Cat and the Canary”? Another silent heart throb, Philo McCullough, worked on “Sugarfoot”. Ditto Tom Kennedy, Edgar’s brother, and former B-star Jack Perrin, also Ken Maynard’s brother, Kermit, a B-western star and a helluva horseman. Kermit, I’m eternally beholdin’ to you. When we rode together, you managed to stifle snickers. ‘Course, when I alit from my hoss Penny, the cowhands would greet me, “Hey Hoot! Save your money!” Hmmm, Legend hath it the great James Mason wound-up his brilliant career working extra—needed money for alimony and child support. One night I climbed onto the back of Wayde Preston’s hog. We rode high into the hills to an assistant director’s house. He answered the door in drag. “Ooops! I didn’t know this is a costume party.” “It isn’t.” “Oh.” The Warner gang was there. To my eyes, the prettiest extras on our lot were the Corbett twins, Jeanie and Joanie. They usually played dancehall gals. They usually stole the scene. The hour was late. Sweet patootie Jeanie upped to me. We engaged in a goofy, giddy gabfest. Suddenly, her fiancé entered the scene. He Ko’d Jeanie with one punch. I forgot to duck. Pow! Ladies and gents, I direct your attention to the floor. There on his keester, blood a’streamin’, is that famous TV cowboy hero! Wayde was gone. I hitched a ride to the horsepital. Funny, huh? They had me in stitches. Back at work, I got the CCC treatment: Claudette Colbert Cowboy. They shot me strictly on the left side, til the wound healed. Wayde told me he wished he’d been there. Good he wasn’t. He was one tough hombre. Jeanie would have had to find another Mr. Right Cross. Sad to say, Jeanie married the guy. Sad to say; it went phhht. My favorite extra moment? “Cimarron” with Dix ‘n’ Dunne. Saw it 30 years ago. Early on, a town of the Old West, extras galore. A foxy grandpa amblin’ along a rickety boardwalk. He slows, stops, scratches his head. Durned if he didn’t forget something. He wheels, goes back where he came from…faster, a hitch in his gitalong, laffin’ and scratchin’. Bless you, old gent. I remember. Maybe, the most famous extra of them all, a Union soldier in D. W. Griffith’s “Birth of a Nation”. He stands guard. Lillian Gish walks by. The guard leans on his rifle and gazes at her with such admiration, longing, doglike devotion that it got yells of understanding and joy from audiences. D. W. caught the magic. A new discovery! “Boys, find that man!” Too late. The man had melted into the horde of extras, never to be seen again. Once, I worked on a slapstick TV pilot at Paramount. “Legal Eagle” by name. I was The Eagle. Big scene on the city street set, site of many a rambunctious Harold Lloyd chase. Larry Dobkin (right), director. Extras galore. Dobkin spoke to them. He described the scene and told them how important they were to its success. They were to think of themselves as stars of the scene, just as we think of ourselves as stars of our lives. One take! Played like gangbusters! We basked in the glow of Dobkin’s bright smile. Larry Dobkin. Fine director. Fine feller.